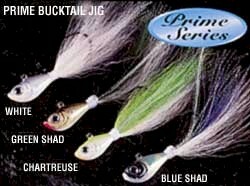 The prime bucktail is one of the most versatile lures known, and with bulging prismatic eyes, lifelike holographic head finish, and traces of flash on each side the Spro Bucktail has vastly improved upon the standard bucktail design. Available in sizes applicable to all inshore fisheries, anglers will appreciate the increased hook penetration due to the chemically sharpened Gamakatsu hook. Tipped with a plastic grub or strip of bait, fish find the Spro Bucktail irresistible. It is not like any other jig on the market. The unique shape of the head and placement of the eyelet help bring this lure to life. With bulging eyes, holographic finish, and blazing color, it puts fish at your mercy. The uniqueness of this bait is that it doesn't fall or hang straight down like other bucktails. It glides through the water, almost swimming along. When jigged, its body stays almost parallel to the bottom maintaining a very natural appearance. Like all SPRO products, Prime Bucktail Jigs are made with durable, super sharp Gamakatsu hooks. Once you fish it, you'll know why SPRO is the shape of things to come. It's hard to fish the Prime Bucktail wrong. It can be jigged off the bottom of weakfish, fluke, or other saltwater fish. Cast it at schooling fish working it quickly back to the boat for cobia, stripers, snook, or dolphin. Swim it along in freshwater for big bass and walleyes, or troll it for reservoir stripers. It's hard to find somewhere that the Prime Bucktail won't work.